Today we have brought to you some of the ongoing topics and Latest News Headlines under our today's Current Affairs Updates - 24th April 2018. These news comes under different sections of National Affairs, International Affairs, Ranking, Schemes, Obituary and other similar sections. 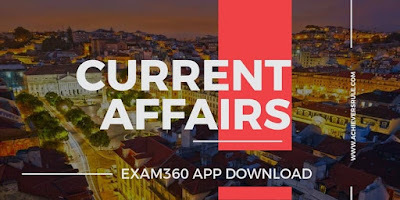 These are very important for IBPS PO, IBPS CLERK, SSC CGL, SSC CHSL, Railway and SBI PO and SBI CLERK and aspirants should go through these in details to know more about the Current Affairs section. Aspirants should also practice the Daily Current Affairs Quiz and Static One Liner and GK Note Down points. The Union ministry of electronics and information technology under its Digital India programme announced Karang as the first cashless island in India on Friday. Confirming it, deputy commissioner M Harekrishna of Bishnupur district said the island fulfilled the Centre’s necessary criteria. Conservative candidate Mario Abdo Benitez of Paraguay's ruling Colorado Party narrowly defeated his opposition in the country's presidential elections. Axis Bank, which recently said that the tenure of MD and CEO Shikha Sharma would end on December 31, has appointed global recruitment firm Egon Zehnder to find a successor for the top post. India is expected to retain its position as the top remittances receiving country, with its diaspora set to pump in a whopping USD 65 billion in the year 2017, the World Bank said today. With insurgency-related incidents in the northeast region down by 85% from the levels recorded at the peak of militancy two decades ago, the Centre has withdrawn the Armed Forces Special Powers Act (AFSPA) totally from Meghalaya as well as from eight out of 16 police stations in Arunachal Pradesh, with effect from March 31, 2018. Bengal has once again topped in the country with Digambarpur Gram Panchayat (GP) bagging the Centre’s award for the best GP in the country. Besides this, some more Gram Panchayats in districts including Purulia, Birbhum and Burdwan have also been awarded special prizes for certain achievements. TCS shares moved nearly 4 per cent higher today at day's high, extending their Friday's surge. TCS shares rose today by 4 per cent to Rs. 3,557, pushing the market capitalisation of India's biggest outsourcer to over Rs. 6.8 lakh crore. Former foreign secretary, Subrahmanyam Jaishankar is all set to join the Tata group as President of Global Corporate Affairs. During his visit, Lanba will hold bilateral discussions with the Commander of the Iranian Navy, and other participating chiefs of navies and heads of maritime agencies during the 6th edition of the Indian Ocean Naval Symposium (IONS) in Tehran between April 23 and 25. Nitish Kumar Launches 3 Books titled- 'Mister M K Gandhi Ki Champaran Diary' written by Arvind Mohan, 'Champaran Andolan 1917' edited by Ashutosh Partheshwar and 'Pir Muhammad Munis: Kalam Ka Satyagrahi' On Mahatma Gandhi's Champaran Movement. The NeSL became India's first information utility (IU) for bankruptcy cases under the 'Insolvency and Bankruptcy Code (IBC) 2016' in October 2017. Lalit Kala Akademi, organised the award ceremony of the 1st Print Biennale India 2018 (PBI)in New Delhi. It was the first-ever International Print Biennale, an International Exhibition of Graphic Prints. Canadian Foreign Minister Chrystia Freeland says Canada and the European Union will host the world's first female foreign ministers' meeting in September. Rafael Nadal won a record 31st Masters title after beating Kei Nishikori 6-3, 6-2 in the Monte Carlo Masters final Sunday. Besides host Nepal, Bangladesh, Bhutan, India, Pakistan and Sri Lanka participating in a three day championship. All seven Indian women won gold medals, while three men out of six bagged the yellow metal at the continental level judo event held in Nepal. Liverpool forward Mohamed 'Mo' Salah has won the Professional Footballers' Association (PFA) player of the year award for the 2017-2018 season on Sunday.